The term “lady fingers” is a nickname for okra, a small, long green vegetable. Okra’s texture and appearance can be off-putting for cooks who aren’t sure how to handle the vegetable, but it boasts admirable nutritional value and a significant store of healthful vitamins and minerals. Okra’s low calorie count per serving make it an excellent choice for people who are trying to lose or maintain weight. My Pyramid points out that okra and other vegetables have the potential to reduce risks of cancer, stroke, heart disease, diabetes, kidney stones and bone loss as part of a balanced diet. Although all varieties of okra have very similar nutritional profiles, there are slight differences among them in appearance and taste. The Centers for Disease Control and Prevention notes that a half dozen types of okra are commonly available, including the Clemson, Lee, Emerald and Annie Oakley varieties as well as purple okra and Chinese okra, which can grow to more than a foot long. According to the University of Illinois Extension, a half-cup serving of sliced, cooked okra without any additions has 25 calories, 2 g dietary fiber, about 6 g carbohydrates, 1.5 g protein and healthy amounts of vitamin A, vitamin C, folic acid, calcium, potassium and magnesium. As with most vegetables, okra is free of fat, cholesterol and sodium and contains a negligible amount of sugar, making it an ideal diet food. One of okra’s distinctive features is a slimy juice that comes from its core. The more you slice a piece of okra, the more slime it will exude. 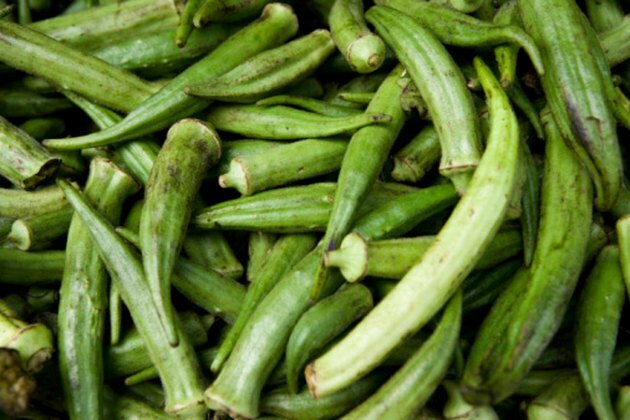 The CDC notes that you can cut down on the amount of okra slime by trimming off the ends of the vegetable and not puncturing its inner pod or by refraining from overcooking the okra. However, many people like to use slimy pieces of okra in recipes to thicken broths, soups and stews. When it doesn’t refer to okra, “lady fingers” is also a common name for a type of cookie, which has very different nutritional information. According to an All Recipes version of lady fingers, a single small cookie made with eggs, sugar, flour and baking powder has 25 calories, about 0.5 g fat, 18 mg cholesterol, about 4.5 g carbohydrates, almost 1 g protein and negligible amounts of dietary fiber and sodium. Although it’s a healthier treat than some heavier desserts, the lady finger cookie is not as valuable as a diet choice as the more nutritious okra. My Pyramid: Why Is It Important to Eat Fruit?